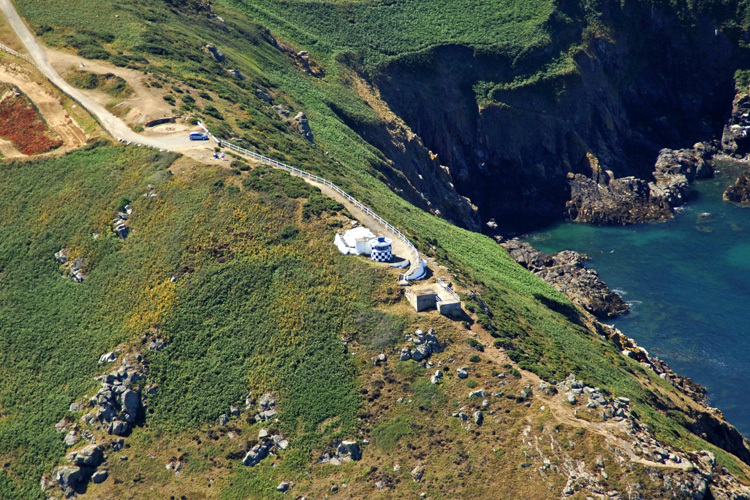 The above aerial photo shows the lighthouse when it was painted black and white chequered. It is now painted totally white as in the image below. Built in 1938 and located on top a cliff on the northern end of the island. It was originally painted in a black and white chequered board pattern, but in 2009 it was repainted white all over including the adjacent rock faces. The grounds are open to the public, but the tower isn't, as it is still operational. The light, formerly shone through the long window, but is now in a small yellow lantern on top of the structure. white or red light, depending on direction, 2 s on, 5.5 s off. The grounds are open to the public, but the tower isn't.